Crocodilians are reptiles, the first of which appeared around 320 million years ago. Reptiles arose directly from the amphibians, a diverse group of animals at that time. At the time that reptiles evolved, the world's fauna consisted of invertebrates, fish and amphibians - mammals or birds were to evolve from reptiles some 120-180 million years later. To understand why reptiles were destined to be so successful, it is important to look at the structure of their eggs. Amphibians usually spawn their eggs, with fertilisation taking place outside the body, typically with the male shedding sperm over unfertilised eggs deposited by the female. The eggs are very susceptible to desiccation, and so the majority of amphibian species must lay their eggs in water or at least in very moist places. In addition, the eggs are typically small and contain little food for the developing embryo - as a consequence, free-living embryos (tadpoles) are essential. This mode of reproduction limited amphibians to areas containing water. 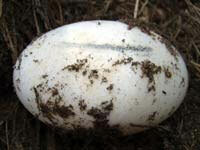 The reptile egg shows a number of advances over the amphibian egg. Firstly, it is contained within an eggshell, which controls water loss. Secondly, it is endowed with a substantial food supply (yolk), which provides sufficient nutrition for the embryo to completely forego a “tadpole” stage. Thirdly, the eggs are fertilised within the female, before they are laid. Thus, males do not have to be present at the exact time of egg-laying. Taken together, these attributes allowed reptiles to reproduce without the need to return to water. They allowed reptiles to dominate the terrestrial environment. Between 320 and 220 million years ago, there was an explosion of different reptile body forms - some were large, others were small, some dominated the land surfaces, others the sea. The "Age of Reptiles" had arrived, and reptiles were to flourish for 155 million years. About 65 million years ago, the group suddenly suffered mass extinction - most of the known reptiles from that time entered the fossil record. The first clearly recognisable crocodilian fossils are about 200 million years old (Suborders Protosuchia and Sphenosuchia). Shortly after the first archosaurs (“Ruling Reptiles”) appeared, but before they had undergone a massive radiation, a terrestrial crocodilian appeared (Orthosuchus). 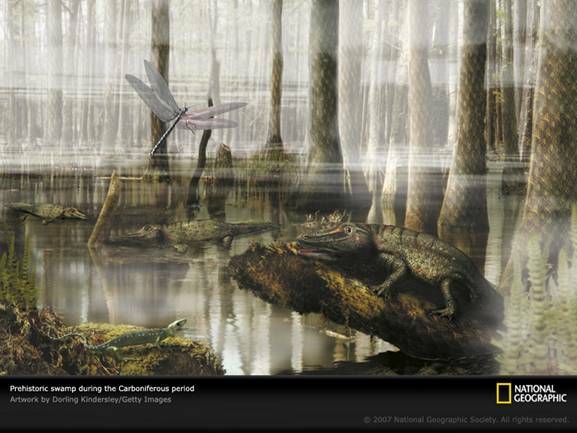 All crocodilians were probably terrestrial for a good 20 million years before they invaded the seas, lakes and swamps. The Mesosuchians were the largest group of early crocodilians, which included both terrestrial and marine forms. Marine Mesosuchians had flippers rather than feet and had a laterally compressed tails resembling those of sharks. Yet there were also specialised, carnivorous, land-dwelling Mesosaurs with long, serrated teeth. Most Mesosuchians became extinct 65 million years ago, but some managed to survive in Australia until about 1 million years ago. In contrast, the Eusuchians, the group to which all living crocodilians belong, were a rather conservative group. The first Eusuchians evolved around 120 million years ago. All surviving crocodilians are in the Order Crocodylia, which is divided into three discrete Families (Crocodylidae, Alligatoridae, Gavialidae), which have been separated from each other for at least 60 million years. K. Richardson, G. Webb and C. Manolis (2000). Crocodiles: Inside and Out. Surrey Beatty and Sons: Sydney.